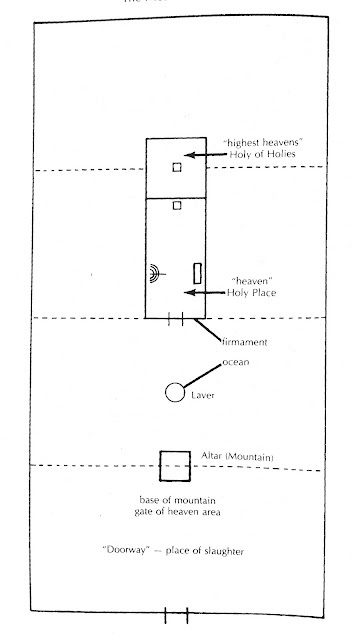 While the altar complex was a holy mountain, leading toward heaven, in a wider sense the entire Tabernacle complex was a holy mountain, or extended ladder to heaven. What makes this clear is the connection between the Tabernacle and Mount Sinai. ...Mount Sinai was a world model that transferred itself to the Tabernacle. When the people left Mount Sinai, they took the Mountain with them. God's cloud covered the top of the mountain, thus establishing it as a Most Holy Place. Moses and Moses alone was allowed to enter this place, just as later on the only the High Priest would be allowed to enter the Most Holy of the Tabernacle (Exodus 19:19-24). At the top of the mountain God gave the Ten Commandments, which were later put in the Most Holy Place of the Tabernacle. Midway down the mountain was the Holy Place. ...The courtyard of the mountain was marked off with a boundary, and anyone who trespassed was put to death (Exodus 19:12). Inside this boundary was placed an altar, and only certain select young men might approach it (Exodus 24:4, 5; cp. 19:22, 24). ...The boundary around the mountain correlates to the boundary inside the courtyard that kept the people from approaching the altar. 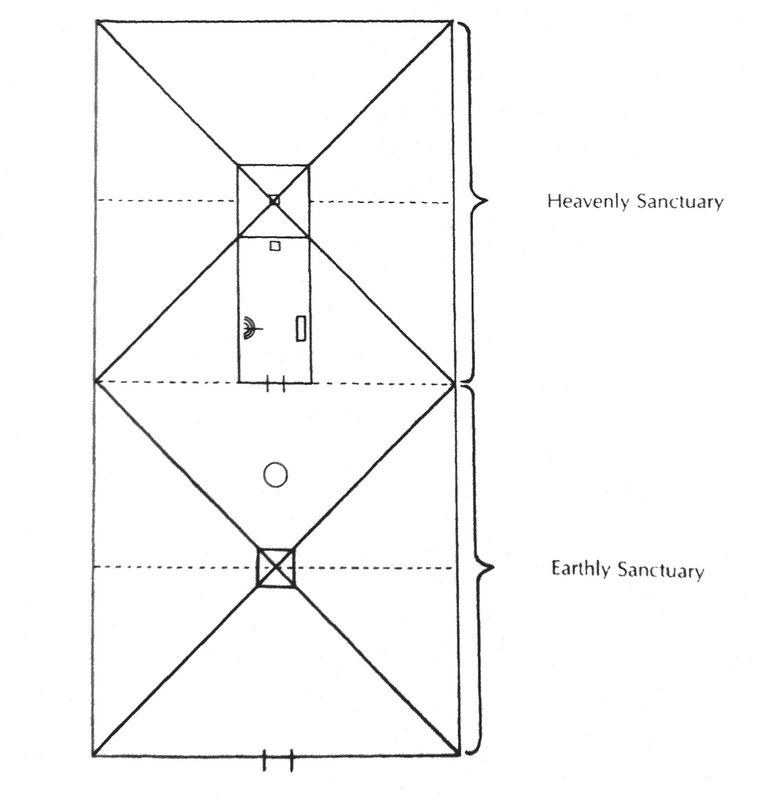 The Bible tells us that the Tabernacle and its courtyard symbolized the heavens and the earth, God's dwelling places. Heaven was God's throne, and the earth His footstool (Isaiah 66:1; Matthew 5:35; Acts 7:49). This was set out in two ways in the Tabernacle. In the Most Holy Place, the heavenly throne was pictured by the winged cherubim. God sat enthroned on the outspread wings of the cherubim, with His feet on the mercy seat that covered the Ark of the Covenant. 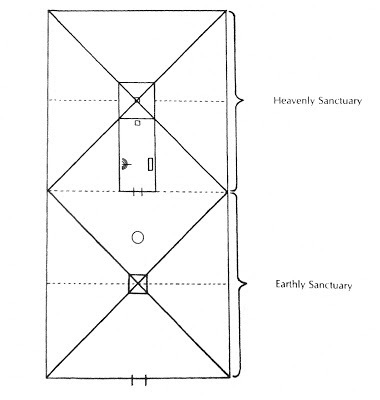 ...Second, the whole Tabernacle proper was a model of heaven (Hebrews 8:5; 9:23-25). 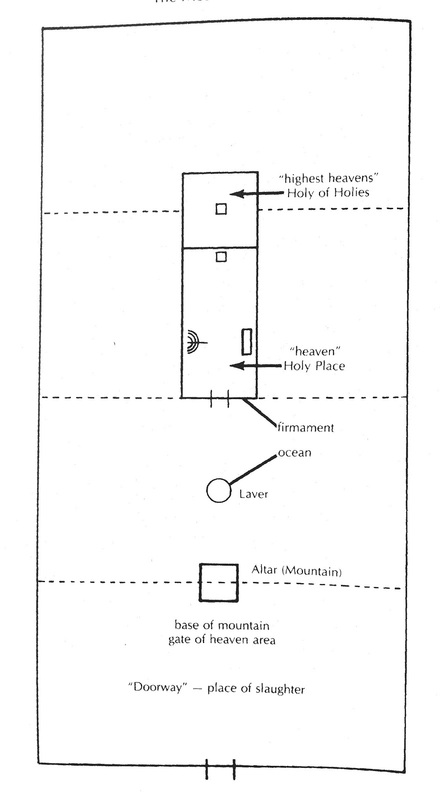 The Most Holy Place itself was a model of the highest heavens, with the firmament or earthly heavens pictured in the Holy Place, and the earth pictured in the courtyard. The Courtyard altar was the holy mountain that reached toward the sky, pictured in the Holy Place behind the first veil, a veil of blue sky. ...As we pass through the firmament-heavens of the Holy Place, we come to a second altar, which is as it were a second ladder stretching from the firmament-heavens to the highest heavens. Beyond the cherubic second veil, behind this golden altar was the Most Holy Place, the Highest Heavens.